I love pareidolia — seeing patterns in random or semi-random objects. One of the most common types of this is seeing faces in things like clouds. Even fictional character faces. But our brains are hardwired to do this, and there are times when you can't not see the pattern. The Horsehead is at the upper right, a gigantic chess piece staring indifferently to the north. Besides being just plain old gorgeous, this image is interesting; it's a recent remastering of an older image by astrophotographer Robert Gendler, and is actually a merging of two separate shots. One is a wide-field image taken using the Visible and Infrared Survey Telescope for Astronomy (VISTA), and encompasses the entire frame you see above. Composited onto that is a smaller region centered just on the Horsehead taken by the Hubble Space Telescope. I got a kick out of examining the image closely. Why? Look at the stars. They all have those X-shaped spikes going through them, what astronomers call diffraction spikes. They're caused by light passing by thin metal vanes holding a second mirror in place inside a telescope. The rotation of the spikes relative to the edge of the image depends on the position of the camera used to take the image. Look at the stars on the left or in the center, and the diffraction spikes are vertical and horizontal. That's the part from VISTA. Now look at the Horsehead itself: for example, the star at the horse's "mouth." The diffraction spikes are at a 45° angle! That's true for the Hubble part of this image, where the camera used is rotated. And in some, you can see 8 spikes! That's where Gendler overlapped the two images. It's so seamless that unless you know what you're looking for you'd never notice. Whoa. You can see the Horsehead right in the middle, a tiny ghostly black equine against the pink gas around it. Ignoring the small size, it looks quite different than Gendler's version, doesn't it? That's because Demeter used a visible light telescope and camera, the kind of light our eyes see, while Gendler's VISTA/Hubble image is in infrared light, just outside the color range our eyes can see. 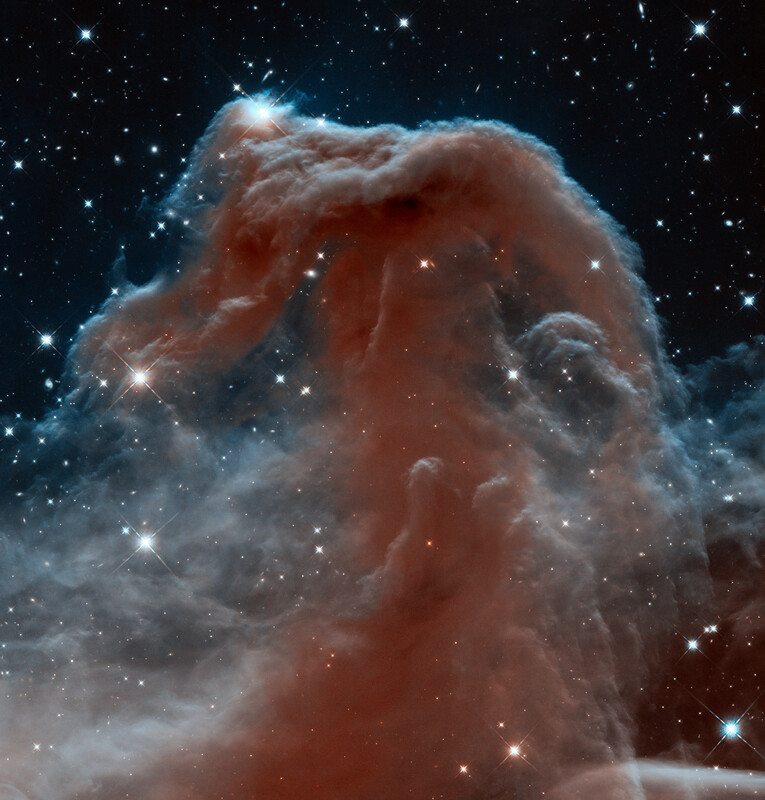 The Horsehead is what we call a dark nebula, thick with small grains of interstellar dust. These block visible light, so when we see them against a bright background they appear in silhouette. But infrared light pierces that dust, so the gas behind the Horsehead isn't as obvious, while structures in the dust itself are easier to see. The original high-resolution Hubble image is so detailed it looks almost like a waterfall, or fog spilling over a mountainside. It's gorgeous. The nebula to the lower left of the Horsehead is called the Flame Nebula. In visible light it has a dark dust lane splitting it, making it look very much like a dark wick with a candle flame around it. However, again, in the VISTA image you don't see the dust as dark, but as a structure going vertically across what looks like a hole carved in the gas and dust. And that's just what it is! There's a cluster of newly formed stars in the center of the cluster, and they ate away at the inside of their cocoon, forming a blister in the side of the cloud. But they have help. The bright star between the Horsehead and the Flame is Alnitak, a brutal powerhouse. It's actually three stars orbiting each other, and one is a beast more than thirty times the mass of the Sun. It blasts out a quarter million times as much energy as the Sun does, and all that energy is helping to excite the gas in the Flame Nebula and make it glow as it does. And here's a cool thing: You know Alnitak, even if you don't know its name. It's the easternmost star in Orion's belt! In fact, in Demeter's wide field image you can see all three stars in the belt, with Alnitak near the center, Alnilam to the upper left, and Mintaka to the upper left of that. Although close to each other in the sky, they are actually separated from each other by a hundred light-years or more, so they aren't physically associated. Now look just to the upper right of the Horsehead in Demeter's image. There's a star there, sitting in the center of a faint reddish bubble. That's Sigma Orionis, another luminous star. It's so bright it's energized the gas around, causing it to glow (we call that sort of bubble an H II ("H 2") region, or a Strömgren sphere). Sigma Ori is also the reason the Horsehead exists! The star is blasting the dust with energy, causing it to dissolve (we call this photoevaporation). A denser knot or knots of gas and dust resist that, forming sandbar-like features in the nebula, and that's what's shaping the Horsehead. It's thicker stuff that's less prone to getting zapped. Incidentally, you can see the famous Orion Nebula to the upper right. I've written about that one or two or ten times before, so indulge yourself. One more thing. All along the bottom is a huge red arc of material. This is called Barnard's Loop, after astronomer E.E. Barnard, who first published about it. It's 10 degrees across, a staggering size (20 times wider than the Moon on the sky!) and may be several hundred light-years wide physically. The last I heard its origin is unclear; it may be debris from a huge supernova, or it may be the edge of material swept up by the winds from stars in Orion, pushed outward like the snow in a snowplow. It's really faint, but shows up well in photos. Obviously. There are about a million other features in both these images, but I think I've given you enough to explore. And as I write this it's winter in the Northern Hemisphere, and Orion is up high to the south after sunset. Go out and look! And marvel at what you can see there, and what you can't. Unless you use science.